Medium Steel, aluminum, copper, bronze. My contemporary sculpture refers to the communication of ideas between artistic, spiritual, and scientific creativity through operations of abstraction and transformation. In my objects, I strive to bring forth metaphors of spirituality, high ideals, and perhaps to some degree the exploration of the unknown. - Bernalillo County Courthouse Collection, diffraction grating series, 48" x 48", "Galileo's Library," upper floor Contemporary Art Collection, Bernalillo County Courthouse, Albuquerque, NM. 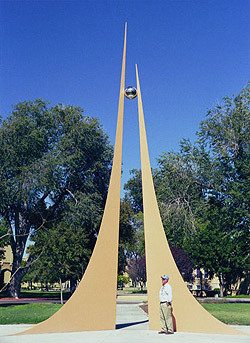 - New Mexico Military Institute, painted steel and stainless steel sphere, 35’ in height, “Reaching For The Stars,” Roswell, NM. - Bernalillo County Courthouse Collection, diffraction grating bas-relief on hammered aluminum, 48” x 48”, “Galileo’s Library,” Albuquerque, NM. - Bernalillo County Courthouse Collection and Bernalillo County Detention Center, bronze bas-relief, 2 of 2, 72” in diameter, Bernalillo County Seal, Albuquerque, NM. - Front lobby of Phillips Lab, Kirtland Air Force Base, diffraction grating painting on hammered aluminum, 84” x 84”, “M-100 Spiral Galaxy In Virgo,” Albuquerque, NM. 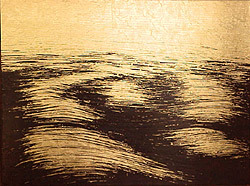 - Hobbs City Hall Collection, Electroformed Copper bas-relief, 22” x 22”, “Sun Katchina,” Hobbs, NM. - Hobbs City Hall Collection, Electroformed Copper bas-relief, 13.5” x 26.5”, “Sunflower Yeis,” Hobbs, NM. - 2004 - Shidoni Gallery, “Finding The Light,” Tesuque, NM. - 2003 - Shidoni Gallery, “Inside, Out,” New Mexico Sculptors Guild Exhibition, Tesuque, NM. - 2002 - The Governor’s Gallery, “In The Round: Sculpture at the Roundhouse”, New Mexico Sculptor’s Guild Exhibition, Santa Fe, NM. - 2001 - COSI Toledo Exploratorium, “COSI Astronomical Art Show”, International Astronomical Artists Association Exhibit, Toledo, OH. - 1999 - The Art Center At Fuller Lodge, “Contemporary Art 1999”, Los Alamos, NM. - 1989 - International Astronomical Artists Association Exhibition; Two metal sculptures in a traveling exhibit through three Russian cities, serving as an olive branch of peace from artist/scientists from the United States. "Reaching for the Stars "